An article written by: Ed Romaine CMO-VP Marketing at Integrated Systems Design – ISD and has spent over 30 years working with organizations looking to improve their warehouse order picking, packing, shipping and assembly systems. Nothing drives profitability out of operations faster than mis-picks, mis-packs and general errors throughout your warehouse. Problems begin with unhappy customers who are questioning why they ever started doing business with you in the first place (and might never do business with you again). As a result, you decide to quickly attempt to fix the problem(s) and all associated costs related to the problem(s). The fixes are holistic and have to touch many facets of your warehouse. First we need to start with the processes and culture of your organization. Next, we must decide which equipment and physical tools we can use to drive your warehouse to order picking and packing perfection. Building Perfection in the Process and Culture? We begin by making sure our order picking and packing processes are well documented and clean of discrepancies and gaps which can force diligent workers following the processes to make errors. This may sound like common sense, but unfortunately this mistake occurs more times than you would ever imagine. To assure you don’t fall into this trap, you must first interview your workers. You need an environment of honesty and good will. You would be amazed as to how many times processes call for one step, and your workers do another only because they are aware that the processes are broken, not effective or missing. It’s important to have an open and honest relationship with everyone on your staff. Everyone from your temp workers, your full time operators, your managers, your directors and up to and including your VPs require the ability to communicate – IN BOTH DIRECTIONS –, this will create success or failure… NO QUESTIONS ASKED! Schedule regular meetings and times to discuss errors, why they happened and how to fix them. To generate the right level of openness and participation, “oiling” everyone up with pizza during lunch is an outstanding tool (subs and other foods work as well). With a little bit of “free” food, everyone is in the right frame of mind to help and participate. This candid and free exchange of opinions and information needs to be free of cynicism and full of positive reinforcement. I assure you, your employees will not only tell you the problems that you don’t know exist, but will solve them just as quickly and often in the same meeting. If only I had a nickel for every time a double bar code verification process (correct item SKU goes to the RF gun and the operator is supposed to scan the product SKU label and then the pallet SKU label for 100% accuracy) is totally ignored. The operator often double scans the pallet SKU label… its faster…but it defeats the purpose of increasing accuracy. Why does this happen? Usually because operators have no knowledge as to why it’s important to scan both labels and/or they are compensated (or punished) for productivity and throughput levels that are not obtainable without “cheating” the system. Aligning compensation to reinforce positive actions benefiting your organization’s short, medium and long term goals are vital. My favorite alignment compensation policy is a weekly “all or nothing” bonus. Achievable levels of throughput, accuracy, safety and attendance needs to be achieved to hit bonus. It’s an all or nothing bonus based on obtainable levels that benefit the employee and the company. Certainly hitting a day’s numbers is important, but if you aren't in the 98% to 99.99%+ striving for perfection you need to evaluate policies and also technologies to achieve truly 100% accuracy. Do the math on the cost of your mis-picks. You will often discover that by just increasing accuracy .02% quickly adds up to quite a bit of money not to mention when you factor in the soft costs of customer satisfaction and lost sales. Working our way from simple to easy tools and technologies, let’s look at some ideas that provide a fast return on investment, low acquisition costs and are easily implemented. Posting individual and/or group error rates. This can be as simple as posting paper on a bulletin board or as complicated as a large display or monitor showing real time accuracy levels. This usually requires data from a simple report generated by the WMS or WCS software system. Posting errors and picking rates can also foster good proctoring practices if it’s built into your culture. Allow the individual who is setting the bar to teach and tutor those who “don’t get it.” The outcome is often a great win-win scenario for everyone. Everyone wants to do a good job (or you have to talk to HR and find out why they are working for you). Showing everyone where their numbers are and what they need to achieve often brings out the best in people. Having individuals and teams competing against each other drives enthusiasm up and is extremely contagious (in a good way). Once again, the devil in the detail is to do this in a positive, fun way and not punitive and negative way. The pursuit of perfection is a chosen path. The trick is to divide and conquer. Allow your process, staff, tools and technologies to incrementally get you further to 100% accuracy. Remember, weigh everything! I’m not suggesting that every order and SKU should be weighed to measure the accuracy of each and every order. I’m telling you that a large percentage of your orders should be weighed, and by implementing a weigh scale and software verification system takes very little resources and will verify that percentage of orders in split seconds. If this eliminates only half the orders that can be verified this way, imagine the burden you have taken off your checkers and QC people with very little effort. We build this process into almost every system we design and implement. The wrong documentation going into the wrong order. Today, most organizations have employees handling piles of documents to look at an order, match it up to the document they have in their pile and place it in the order before sealing and shipping. Wow. The errors and waste of labor in this process is dramatic. Using an automated document printer and inserter system (that start at $40,000 and insert up to 3000 documents an hour) solves this problem. This type of system provides a double bar code which verifies the right document is going into the right order… in seconds. I can discuss the way to generate revenue for the warehouse using these technologies, but I’ll keep that for another article for another day. Let’s say this system provides 100% accuracy and often has a 6 month ROI (fast and easy). The use of pick to light and put to light indicators can be implemented in many processes to minimize errors. To make this very cost effective, the integration of goods to person technologies (such as carousels, VLMs, shuttle technologies, ASRS, etc) should be used. 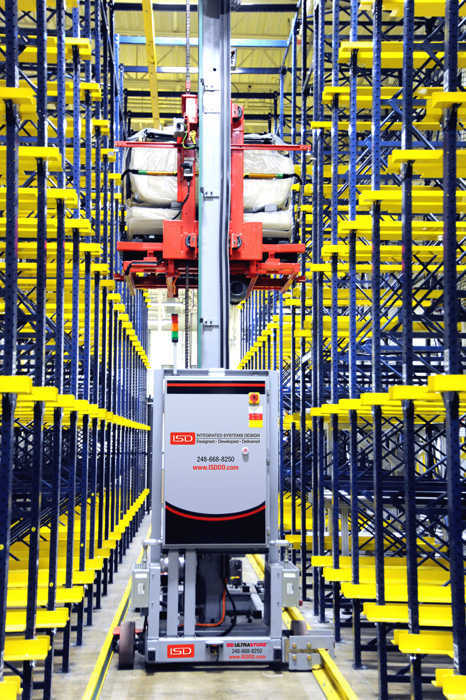 Items are delivered to the operator at an ergonomic height, and the lights tell the operator where and how many items to pick and put into the correct order. The reason goods to person technologies are important to integrate with pick lights is you are not lighting up every position like you do football fields of flow rack. The number of displays are few and very effective. Voice picking comes into play when you have a large number of SKUs in shelving or rack not using goods to person technologies. The audio directs the picker to the correct location and quantity. The picker then verifies the SKU and quantity. The throughput levels often increase slightly with this technology, but your accuracy will often increase higher. This is especially true for operations which require the picker’s hands to be used for picking and counting. The voice picking method frees up the workers hands. Slotting your inventory will provide great benefits in the form of increasing throughput and providing increased accuracy levels. Slotting is the process of keeping similar types of inventory items together. The similarity of the inventory can be categorized as velocity, physical size, frequency of picking the same items together, seasonality and other characteristics which lend themselves to some intelligent grouping. One example of slotting would be having a carburetor, spark plugs and cables located on the same shelf since customers order all these parts to complete a project. Kitting could be another option, but in some cases, while knitting does increase inventory levels, the variables may create too many kit options. Slotting increases your accuracy by eliminating operator walk and search time searching for SKUs in distant parts of your warehouse. Visual scanning of items within an order. This technology has been around for a while, but the cost and accuracy has increased dramatically over the past couple of years. The vision system simply looks inside totes or boxes of picked items and identifies each SKU in that order. It then verifies the accuracy and routes via conveyor to quality checkers any orders that may be questionable. This allows your checkers to review far fewer orders (requiring far less labor), but positively impacting the overall accuracy levels dramatically for each error found. If you haven't reviewed and investigated this technology in the past two years, you owe it to yourself to check it out again. Often the number one source of errors is the counting of small items. We covered the use of weigh scales which can eliminate a large number of these mis-picks after the fact, but how about during the picking process? Parts images and photos on the PC monitor when directing the picker. Many of today’s WMS, WCS and inventory management and picking software solutions allow organizations to include images of an item in their database. On some parts, common sense might rule, but when dealing with inner packs, custom packaging and proprietary parts with unique configurations, a simple image helps an operator confirm in milli-seconds what they are seeing and picking. This is especially helpful in organizations which use temporary labor to fill in for their full time operators. Creating active light grids on shelving or goods to person pick faces. This practice is used more frequently on SKUs in smaller totes or boxes across wide spans of shelving or tray. By building an XY grid of lights on the center of each shelf level and column you can set an audible and light alarm to indicate the operator is in the wrong cell/SKU location. So, these 12 steps and ideas ranging the gamut from simple to complex should be investigated and analyzed to help your organization not only hit the 100% accuracy mark, but to improve productivity and system throughput and create a dramatic financial return on investment. Organizations such as ISD can provide valuable resources in determining the feasibility for your warehouse. Call or email today for a free survey to begin the drive to picking and packing perfection.